In an adaptive learning journey learners are offered lessons about learning objectives they master the least. The goal is to let the learners learn as efficient as possible. The goals that are allready mastered, less attention is required. For this tutorial you will need the following roles: Author, Designer (and Administrator). Key 1: Take all the time you can to create the course. Really take the time for it. Especially invest time in contemplating and completing the concept, the creation of learning objectives and questions. Key 2: Carefully consider the learning objectives. There can be found many usefull information on the internet on how to make good learning objectives. To make adaptivity work properly it is important to make learning objectives very specific. In the ideal setting questions are exchangeable for each other. Ideally questions within a single learning objective are formulated slightly different from each other in order to assess that single learning objective. For example: the course subject is 'English'. Including a learning objective 'Grammar' is not specific enough, because grammar includes a lot of different subjects. It is better to split 'Grammar' into multiple learning objectives, for example interpunction, plural, compositions et cetera. To check if the learning objective is specific enough you could see how much text you would need to describe the learning objective. Describing 'Grammar' will take a lot of pages, whilst describing 'Interpunction' would take maybe one or two paragraphs. Key 3: Make plenty of questions per learning objective. By creating a lot of questions per learning objective, you will make it possible to constantly give new questions when needed. Key 4: Create enough activities per learning objective. This key is closely related to key 3. If you have many questions, it is possible to create more activities related to the learning objective. The idea whithin an adaptive learning journey is that new lessons are constantly available until the target for that learning objective has been met. With these key's in mind, we can start creating an adaptive learning journey. In this tutorial we will use a language training as an example. Preperation is everything! If you contemplate learning objectives before creating them in aNewSpring, it will be a lot easier to create an adaptive learning journey. Check key 2 about formulating learning objectives. First create a new content library under the tab 'Content' (this can only be done if you are Administrator, or by someone else who has this role) and create a folder structure based on the learning objectives you have contemplated. If you create a good folder structure on which to base the learning objectives, you can use import this structure and the learning objectives in a single click to the template. Articles that can help you with this step: Tutorial: How do I easily create content? Create per learning objective, content and questions and structurize them as in the example above. This is another preperation in order to link questions to the learning objectives with a single click. The learning objective will be named after the folder in which the questions are located. Go to the tab 'Courses' and click on + Template. If you have correctly gone through step 1 this is a breeze. Go to the tab Learning objectives when editing the template and click on the little rocket. The folders in the content library which containt the questions, will be taken as learning objectives. When this is done, you can go to Group and again click on the little rocket in order to create groups based on the folder structure. By creating a pretest, you can give the learner the chance to allready (partially) reach the learning objective targets and thus prevent them from doing unnecessary lessons if they allready master certain learning objectives. If the questions are being used in the MemoTrainer, the objectives that have been met can be practiced and secured in the long-term memory. More about it will be told in the next step. Creating a pretest is not obligatory. The question you should ask yourself is: how many questions should a learner answer right in order to reach the target of a learning objective and not receive any more lessons about it? Set that amount of questions per learning objective in the pretest. The goal here is that if the learner answers all the questions right of the learning objective, there will be given no lessons about that particular learning objective, because the pretest has determined that the learner allready masters this objective. Also check step 9 to understand the scoring. When editing the template go to the tab To do and create an activity (+ Activity), select assessment and when created, click on Edit. 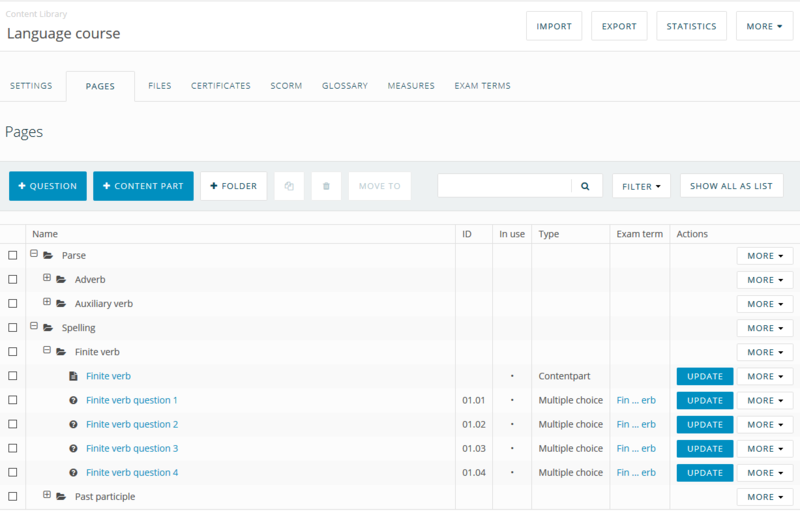 Check each tab to configure the assessment. 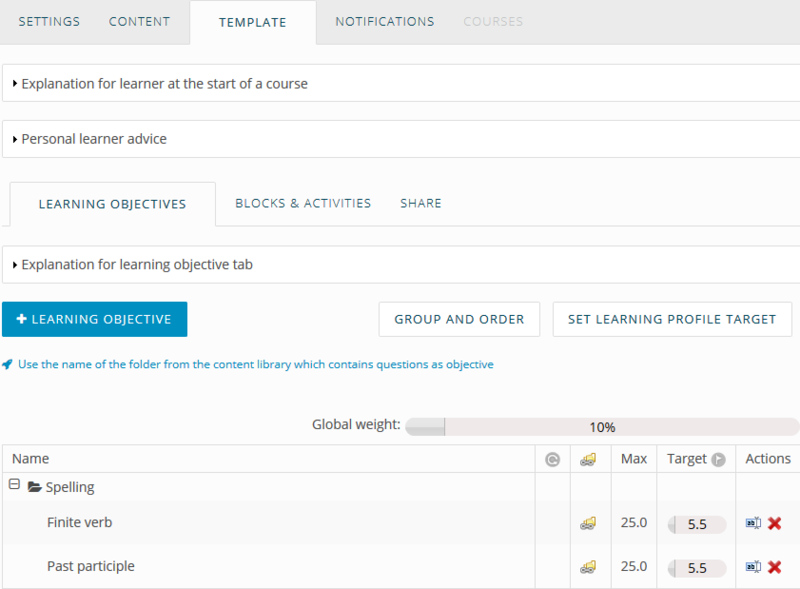 When done, go to the tab Learning objectives if you have allready added the content to the activity via Activity content. The adding of learning objectives is quite easy when you have allready gone through step 1 and 4. Only then you can use the rocket to immediatly link the right learning objectives to the right questions. Because it is possible that the learners cannot do any activities linked to certain learning objectives because the target has allready been met, it might be handy that they keep practicing those learning objectives in the MemoTrainer, in order for the information to be obtained in the long-term memory. Go to the tab Extra MemoTrainable questions and select all the questions that are related to the subjects of the assessment. 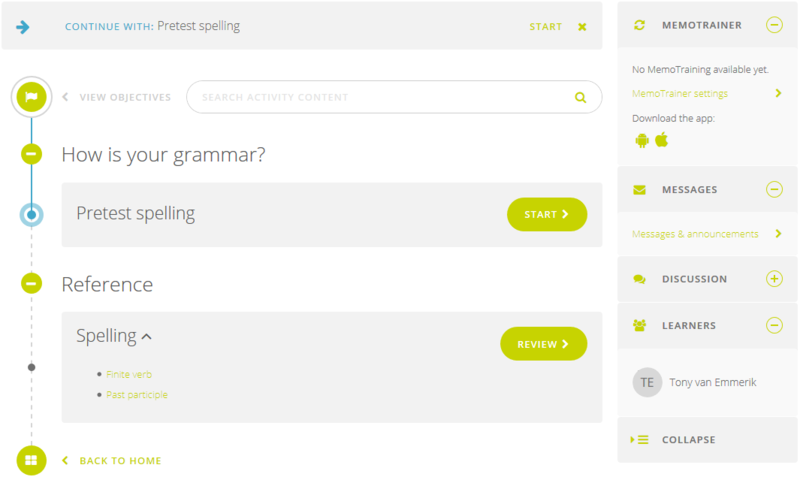 In the example above I have selected all the questions that are listed within 'Grammar'. Intermezzo: What does the MemoTrainer do? In the MemoTrainer the questions are repeated in order to secure knowledge in the long-term memory. The questions that have been answered incorrectly will be asked more frequently than those that have been answered correctly. The progress is visible in the knowledge retention. In an adaptive learning journey it is a good idea to let the MemoTrainer work based on learning objectives. Questions for the same learning objectives should be exchangeable. The knowledge retention is then being build-up based on the learning objectives. For example: It is possible that learners have answered a singel question wrong from a list of ten of the same learning objective. This one error will be filled up by another question from that learning objective in the next MemoTraining. In order to continue the flow of this tutorial, we will configure the MemoTraining in step 11. Now the time has come to create adaptive blocks. In an adaptive block only one activity is available at once. That will be the activity in which te most progress can be made on a certain learning objective in which the learner has scored the lowest. When the target of a learning objective has been met, there will be no suggested activity in which only that learning objective is present. When keeping in mind that only one activity is available at a time per adaptive block, it might be a good idea to create multiple adaptive blocks. 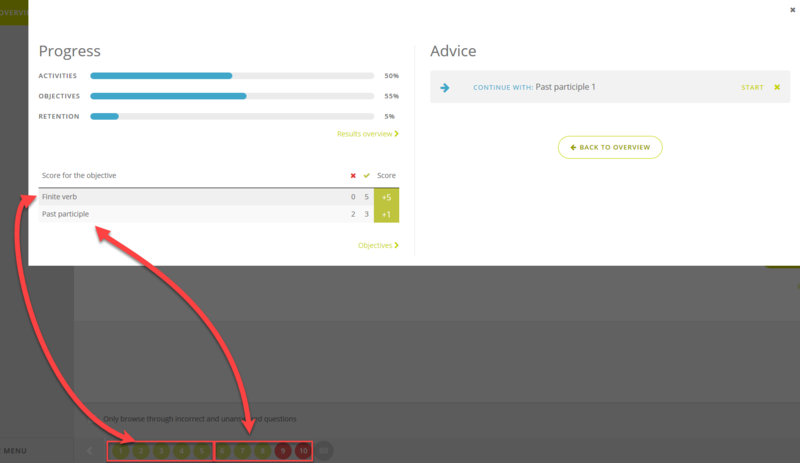 By adding a condition to adaptive blocks you can make sure that learners first have to do the pretest (the learning objective target profile will be patially filled) in order to continue with the activities linked to the learning objectives. To add this condition click on Edit next to the block title. Via the tab Conditions you can add the condition: ... after activity "X" is completed. In this case the activity 'X' is the pretest. General settings of activities - What can I do at the 'Conditions'-tab? Create multiple activities per learning objective. The easiest way is to create lessons which will make it possible to also add content parts to give extra information about the learning objective. If they haven't met the goal at the completion of the activity, then another activity should become available in which they can retry to reach the set goal. - Note that the order of the activities can be different for the learner. The activity in which the learner can work the most on a learning objective will be offered first. 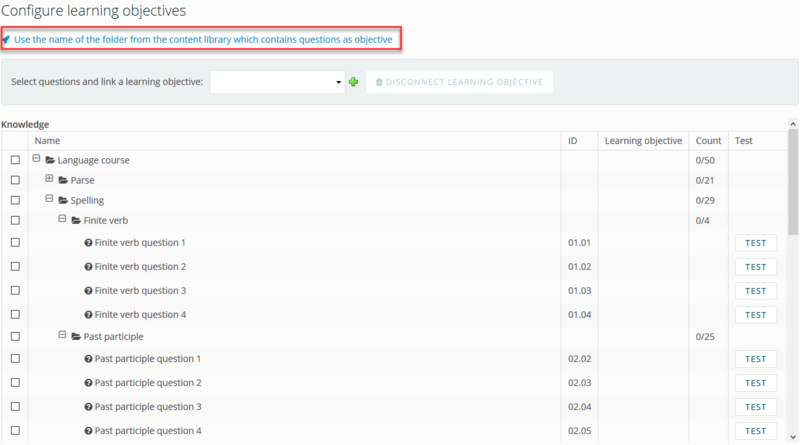 - If you add the same amount of questions per learning objective per activity, then the order you have chosen will be shown. - Add a content part with explanation to each activity. You can also add a new content part which each activity that will explain a bit more each time in order to make them understand the learning objective. - Do not add documentation activities to an adaptive block. You can only link learning objectives to questions and in a documentation activity you can only add content parts. - Create enough activities per learning objective and also add new questions about it in these activities. This is one of the keys to make a good adaptive course. In the example of the language training we have created five activities per learning objectives, each containing five extra questions. - Do not add to many questions per activity. It is better to create more activities with less questions per learning objectives. To better undestand this, see step 8. 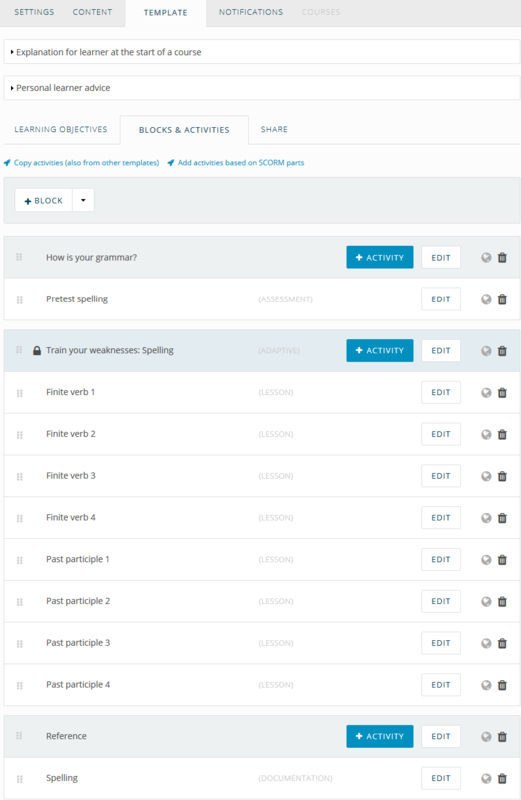 - If you want, you can also add multiple learning objectives in a single activity. This can be usefull when working with cases in which multiple aspects (learning objectives) will be assessed. Do not forget to add the learning objectives to the questions in the activities, such as explained in step 5. Because it is possible that learners do not have to complete lessons for objectives they have mastered in the pretest, this would mean that they would not have the possibility to read the curriculum. This can be solved by adding a block which only contains documentation activities. This type of activity can only consist of content parts and cannot be completed (it can be viewed at any time). This activity is not shown in the personal learning path. If you have added the documentation, click on Edit and add content parts via Activity content. 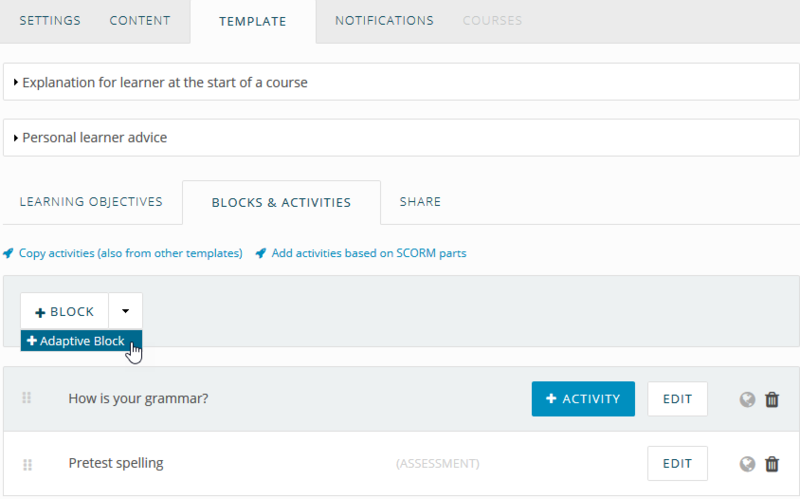 By adding a section per content part (under the tab Activity content), learners can click on a subject and directly go to the subject they want to review. Intermezzo: How does the design look so far? Note: the checkbox Personal learning path is switched on. This is the hardest step, so please read carefully! In the overview below you see that values are filled in under the group 'Spelling'. When setting the learning profile target you can save multiple profiles, so that you can use these different profiles for different courses. For example we could publish this course for different education levels, by applying the different profiles to the courses. Set the weight and click on Save. Then set another weight and click on Save again. Continue untill you have all the profiles you need. Course settings - Tab: Settings - As an administrator you can select per course a different profile target. The questions in assessments and lessons in this tutorial have been made MemoTrainable. By also linking the learning objectives to the MemoTrainable questions, the knowledge intake is also build-up on basis of these learning objectives. If you have succesfully completed step 1, you can add all learning objectives at once using the rocket 'Use the name of the folder from the content library which contains questions as objective'.